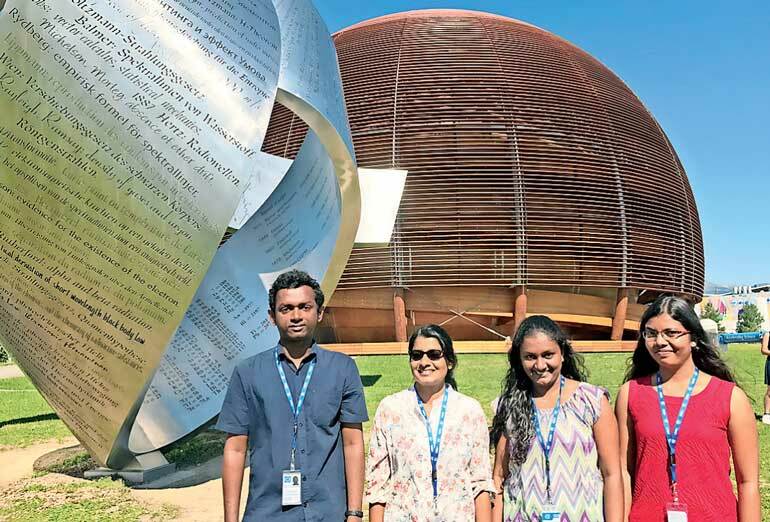 For the second consecutive year, Sri Lankan students participated in the prestigious summer student program at the European Organization for Nuclear Research (CERN) in Geneva. The four students who completed the two-month program last week were Thenmolie Gnanaguru a graduate of the Department of Physics, University of Jaffna, Nimmitha Karunarathna, a graduate of the Department of Physics, University of Colombo, Kaplanie Madara Liyanage, a graduate of the Department of Physics, University of Ruhuna and Chamini Shammi Pathiraja Mudiyanselage, a final year undergraduate of the Department of Physics, University of Sri Jayewardenepura. 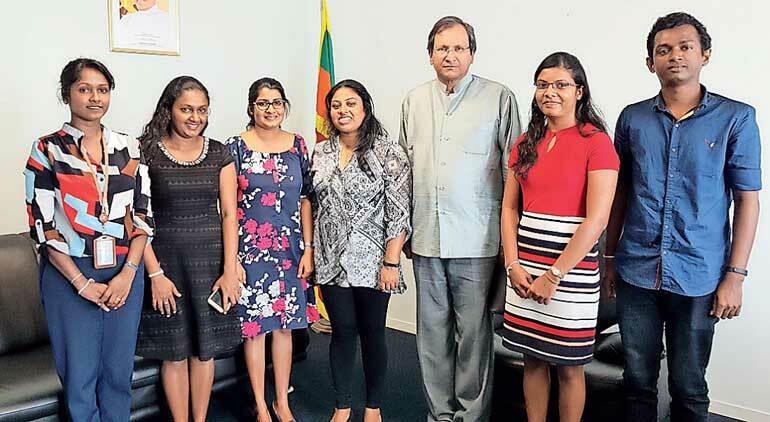 The Sri Lankan students were selected on merit by CERN, following a funding arrangement negotiated by the Permanent Mission in Geneva, where CERN provided financial assistance for two students and the National Science Foundation (NSF), Government of Sri Lanka funded two students. Last year, for the first time, two Sri Lankan undergraduates joined this program, which has been in operation since 1962. 325 international students representing 92 countries joined this year’s coveted summer program. This has been a tangible benefit Sri Lanka accrued following a process initiated in June 2015 by the Permanent Mission to begin cooperation between CERN and the scientific community in Sri Lanka which was galvanised by the signing of the International Cooperation Agreement (ICA) with CERN by the Minister of Science, Technology and Research, Susil Premajayantha in February 2017. It provided a broad legal framework to ensure on a long-term basis, opportunities for participation by scientists, engineers and technicians from Sri Lanka in research projects of CERN, in addition to providing increased opportunities for Sri Lankan undergraduates and physics teachers to participate in CERN’s scientific and training programs such as ‘High-School teacher’ and ‘Summer Student’ programs. From left: Shashika Somaratne, Counsellor of the Permanent Mission of Sri Lanka to the UN in Geneva, Chamini Shammi Pathiraja Mudiyanselage from the University of Sri Jayewardenepura, Kaplanie Madara Liyanage from the University of Ruhuna, Dr. Nadeesha Wickramage, Senior Lecturer, University of Ruhuna and Researcher/Validation Manager, CMS Experiment, CERN, Ambassador Ravinatha Aryasinha, Sri Lanka’s Permanent Representative to the UN in Geneva, Thenmolie Gnanaguru from the University of Jaffna and Nimmitha Karunarathna from the University of Colombo. Sri Lanka is presently in the process of joining the CERN’s high end ‘Compact Muon Solenoid (CMS) Experiment’, as a consortium of Sri Lankan physicists and PhD candidates representing the key universities of Sri Lanka. This follows discussions held by the first Sri Lankan scientific delegation that visited to CERN from 3-5 May. The delegation comprising five physicists representing the universities of Sri Lanka agreed on a Road-Map for future collaboration with CERN and to enhance scientific collaboration in ‘high energy physics’ between the scientific community of Sri Lanka and the CERN. At a de-briefing session with the Sri Lankan students, Sri Lanka’s Permanent Representative to the UN in Geneva Ambassador Ravinatha Aryasinha discussed efforts being made to develop a network of Sri Lankan scientists and researchers, who could remain engaged with the research activities carried out by CERN. He also impressed on the Sri Lankan scholars the importance of sharing the knowledge they had acquired within their respective Universities, as well as the larger community of physics teachers and students in High Schools, so as to popularise Physics. Plans for a visit to Sri Lanka by a scientific delegation from CERN later in the year were also discussed. Associated in this discussion were Shashika Somaratne, Counsellor of the Permanent Mission who coordinates relations with CERN and Dr. Nadeesha Wickramage, Senior Lecturer, Department of Physics, University of Ruhuna, who will be a member of the Consortium of Sri Lankan physicists in the CMS Experiment. Dr. Wickramage is currently working as a part time researcher/L3 Validation Manager in the physics data and Mote-Carlo validation (PdmV) group of CMS, having joined the experiment in 2010.